If you like putting tacos, hotdogs, hamburgers, and friend fries together before it gets to your stomach, I have just the place for you. In the great town of Grecia, just outside of San Jose, Costa Rica, there is a place right next to the main church called Los Pira. If I had come to a place like this in college, I would have been in trouble for sure. The outside of the shop looks no different than any little food joint in San Jose, a sign with no real design, entrance crowded with people, Ticos cooking on a grill behind the counter, but don’t be deceived. There is more than meets the eye. 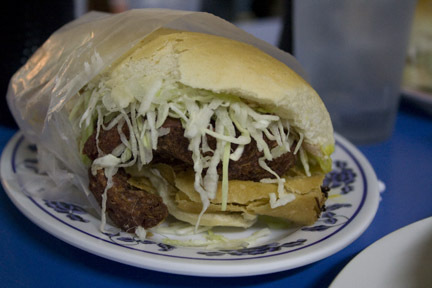 The menu includes traditional hot dogs and hamburgers, tacos (Costa Rican Style), nachos etc, but un-traditionally all piled on top of each other on a bun. I got the Super Pira which was two meat tacos with a sausage/hotdog and coleslaw on a bun. Yes, it was as delicious as it sounds. And fresh french fries on the side with ketchup and a mayonnaise sauce on them. 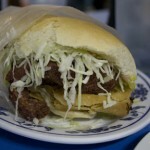 Another option, hamburger with tacos, or add a hot dog on top of that and get it vampiro-style (with ketchup). Ridiculous! And the guy next to me had nachos, and I’m pretty sure it had everything on the menu on top of the chips. Ground meat, sausages, coleslaw, french fries, multiple sauces, hot peppers, etc. Looked amazing. Maybe I’ll get that next time. And don’t let me forget the prices. Less than $2 each plate. Unless you opt for the burger with two sausages and three tacos, which is a whopping $3. 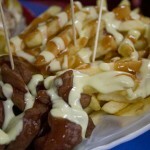 Cheap food is here in Grecia, Costa Rica. Come all!